Rocket torpedoes are armed and atomizers charged! Atomic Xenon surges through every energy conduit! The crew of spaceship Zero awaits your orders! For Spacecorp, for the future! In the thrilling world of the 21st century, Spaceship Zero is the acme of sci-fi adventure! Inspired by serial episodes from the 1050's, this innovative role-playing game promises countless hours of atomic-powered pulse-pounding pulp excitement in an infinite number of alternative universes! We've scoured every episode to fully reproduce the Spaceship Zero experience. Whether you've seen the German television series, found a bootleg copy of the radio show, or seen previews of Spaceship Zero: The Movie, every aspect of Spaceship Zero has been reproduced in loving detail. 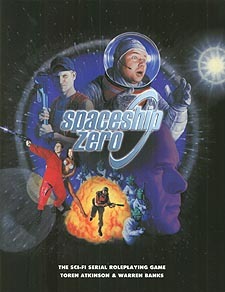 This, the Spaceship Zero RPG is the latest incarnation of this truly original sci-fi universe! Any die hard enthusiast of Spaceship Zero can tell you the story of this epic saga. When Professor Ashton activated his rocketship's Better-Than-Light Drive, he didn't just destroy the universe.... he launched one of the greatest pulp adventures ever seen by man! and the red-blooded, two-fisted, hyper-demonstrative heroes of SpaceCorp! Imagine that you're standing on the bridge of Spaceship Zero, trapped in a universe you never knew! Shambling blasphemous batrachian invaders are conquering an alternative Earth... and they're spawning with captive Earth women! They're torturing the strongest humans in sadistic gladiatorial contests! They're poisoning our atmosphere with mist-spewing ziggurats of greenish alien metal! Can you let the Earth suffer and die? Can You? No, You Can't! Because Spacecorp Needs You! But wait! That's not all! Spaceship Zero also comes with its own original game system: a roleplaying game completely incompatible with other roleplaying systems! Toss away those troublesome twenty-sided dice! Hurl them at the bastions of conformity! We've seen the future, and we're bringing it to you today!